"Speak up for yourself--we want to know what you have to say." From the first moment of her freshman year at Merryweather High, Melinda knows this is a big fat lie, part of the nonsense of high school. She is friendless, outcast, because she busted an end-of-summer party by calling the cops, so now nobody will talk to her, let alone listen to her. As time passes, she becomes increasingly isolated and practically stops talking altogether. Only her art class offers any solace, and it is through her work on an art project that she is finally able to face what really happened at that terrible party: she was raped by an upperclassman, a guy who still attends Merryweather and is still a threat to her. Her healing process has just begun when she has another violent encounter with him. But this time Melinda fights back, refuses to be silent, and thereby achieves a measure of vindication. 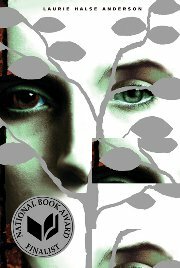 In Laurie Halse Anderson's powerful novel, an utterly believable heroine with a bitterly ironic voice delivers a blow to the hypocritical world of high school. She speaks for many a disenfranchised teenager while demonstrating the importance of speaking up for oneself. Speak was a 1999 National Book Award Finalist for Young People's Literature. Laurie Halse Anderson is a New York Times bestselling author of books for kids of all ages--including Fever 1793, Chains, Twisted, and many others. Known for tackling tough subjects with humor and sensitivity, her work has earned numerous national and state awards, as well as international recognition. Two of her books, Speak and Chains, were National Book Award finalists. Anderson was honored with the 2009 Margaret A. Edwards Award given by the YALSA division of the American Library Association for her "significant and lasting contribution to young adult literature." Anderson was born in Potsdam, New York in 1961. Growing up, she loved reading and listening to family stories. She graduated from Georgetown University in 1984. Before becoming a full-time writer, she was freelance journalist, and then worked part-time at a bookstore to earn money while working on her fiction. Mother of four and wife of one, Laurie lives in northern New York, where she likes to watch the snow fall as she writes. In this powerful novel, a teenage heroine delivers a blow to the hypocritical world of high school.